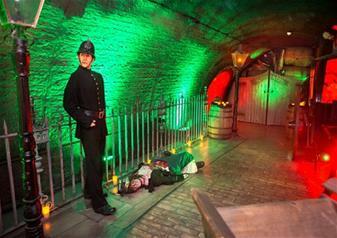 London Bridge Experience The London Bridge Experience gives you the opportunity to become part of London's gruesome history and travel back in time to an age of adventure, uncovering the dark secrets that lie beneath the world’s most famous and haunted bridge. Laugh, scream and cheer your way through 2000 years of history. You will SEE, HEAR and even SMELL what London Bridge was like throughout the ages. Come face to face with Queen Boudica's Iceni tribe and join them as they take on the Roman army, be regaled by tales of terror at The Star Inn on Fish Lane as Jack The Ripper and Ben Crouch lurk in the lanes searching for the next victim and meet The Keeper of The Heads as he takes his latest victim to task before dispatching the body parts to the four corners of the country. Experience medieval life first hand as you pass through the Chapel of Thomas Becket and onto the shop lined streets of London Bridge as the Great Fire of London takes hold and sweeps the city. The show itself is in English however we also offer audio guides in the following languages: French, German, Italian, Polish, Spanish. London Tombs Following your trip through the vortex you will land at The London Tombs and this is where the fun really begins. 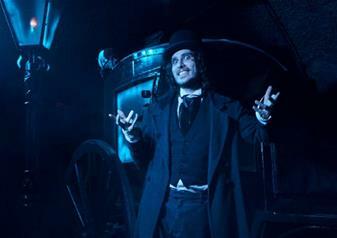 Hold tight to your friends as you make your way through the UK's Scariest Attraction coming face to face with the demons that we keep locked way below. Face your fears, be it evil clowns that will make your blood run cold or confined spaces that will make your hair stand on end. The nesting spiders will try to trap you in their webs and the maniac butcher will definitely want to add you to his impressive collection of limbs that hang around his lair. 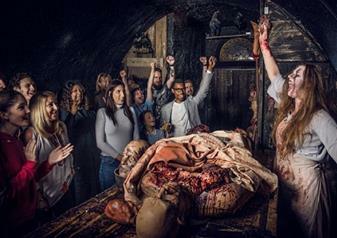 Make your way past walls dripping in blood, squeeze through confined spaces and scream with terror as you are met with an array of unspeakable horrors in this myriad of doom. 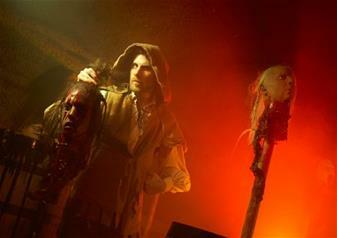 For the faint hearted you are given the option to leave before entering the Tombs. 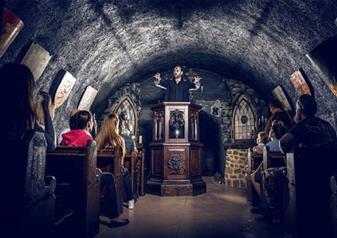 Guardian Angel For children there’s a special children’s tour of The London Tombs called the Guardian Angel tour. The children will be led through the tombs with a guardian angel on an adventure through what the Zombies call home. During this tour there are no zombies there to jump out.